Everyone’s favorite season is here! 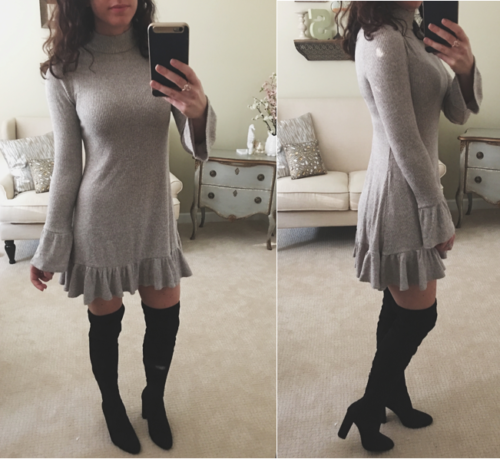 Midwest weather has been rather mild, and I am not quite ready to make the plunge to my cold-weather uniform of leggings, a soft tee, and a comfy cardigan, so might I suggest this lightweight sweater dress from Express? This is made of a thinner material (though I do not find it to be sheer!) and I love it with a pair of OTK boots. It also pairs nicely with a blazer for chilly evenings! I’m wearing the dress in an XS, TTS. It’s also available in burgundy! These boots are true to size, extremely comfortable, and a great substitute for the infamous Stuart Weitzman Hiline boot!